The divinisation of the material life also as well as the inner life is part of what we see as the Divine Plan, but it can only be fulfilled by an out flowing of the inner realisation, something that grows from within outwards, not by the working out of a mental principle. To become ourselves is the one thing to be done; but the true ourselves is that which is within us, and to exceed our outer self of body, life and mind is the condition for this highest being, which is our true and divine being, to become self-revealed and active. 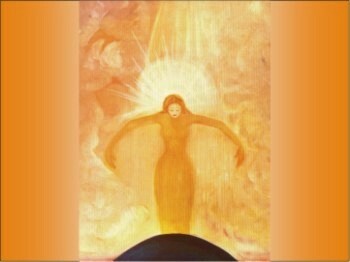 It is only by growing within and living within that we can find it; once that is done, to create from there the spiritual or divine mind, life, body and through this instrumentation to arrive at the creation of a world which shall be the true environment of a divine living, – this is the final object that Force of Nature has set before us. This then is the first necessity, that the individual, each individual, shall discover the Spirit, the divine reality within him and express that in all his being and living.